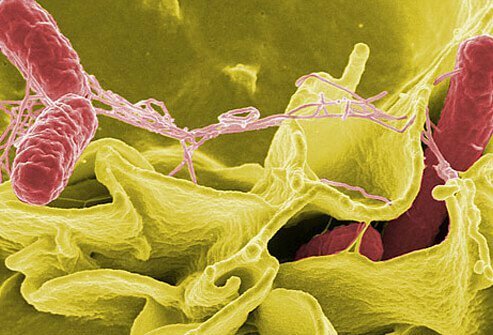 In this article, you will learn all about Salmonella. You’ll find out how it can make you sick, how the bacteria are fighting back against antibiotic medicine and what we can do about it, how to keep your grub safe from these illness-causing organisms, and even what happens when Salmonella grows in space. 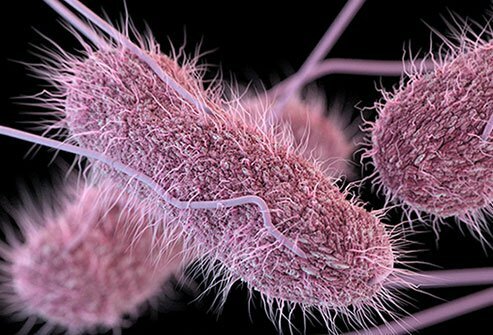 Typhoidal Salmonella typhi infections cause typhoid fever. Someone with typhoid fever will need to take antibiotics. 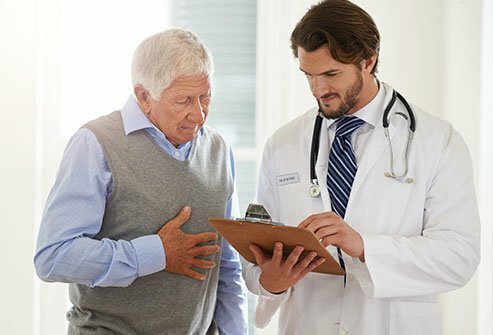 It is important to take the full round of antibiotics and not stop just because you begin to feel better—this disease is notorious for being passed to others after a person’s symptoms decline. We will describe the symptoms and treatment for typhoid more completely later in this article. Salmonellosis symptoms range from mild to severe, and treatments should be dictated accordingly. 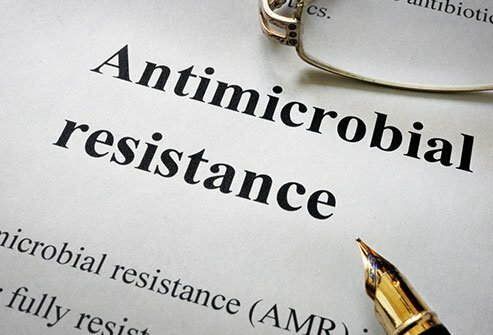 For those with mild symptoms, the WHO recommends no antibiotic treatment, as these bacteria are becoming increasingly resistant to these drugs, and administering them for every patient is likely to lead to further resistance. However, anyone in a particularly vulnerable group, including infants and those older than 65 years old, should receive antibacterial medications. That’s also true for anyone whose infection has spread beyond the digestive system. What’s more, studies have shown that using these antiseptic soaps can kill off certain bacteria, but they leave other bacteria alone. By doing so, they may be contributing to the rise of so-called “super bugs,” which are more resistant to antibiotics and more potentially damaging to human health. 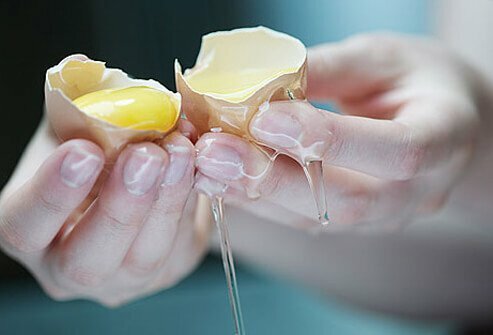 So while our first instinct may be to use antimicrobial soaps for better health, in the long run these soaps may be causing more harm than good. Typhoid comes on gradually. Symptoms don’t develop for about a week after infection. Then it takes about three to four days for a low-grade fever to rise, sometimes as high as 104 degrees. These fevers tend to be worse in the afternoon and evening. Treatment for typhoid is crucial. Without treatment, the fever lasts for about a month and as many as 30% of those infected will die from the disease. Antibiotics are used to eradicate the disease, though this takes about three to five days, during which time a patient’s symptoms may actually get worse. 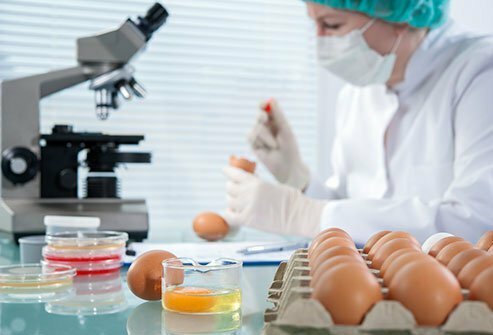 This effort is hampered by the increasing resistance Salmonella bacteria have shown to antimicrobial medicine. The vaccines are not 100% effective, though. If you are traveling to an area where typhoid is a known problem, you will want to take additional precautions. 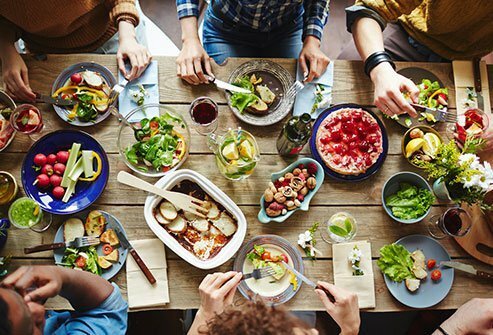 Be careful about where you find your food and water—these are common sources of infection. Also, do your best to avoid anyone sickened by the disease. This isn’t perfectly effective either, though, because someone who is contagious may not have symptoms. 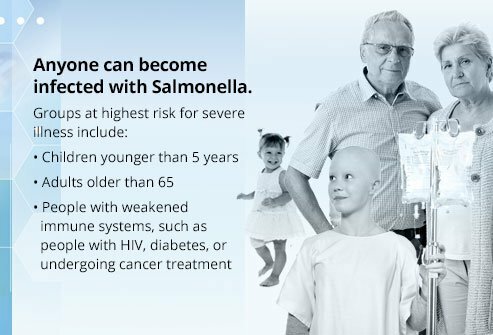 Even when you aren’t eating eggs or animal products, you may still be at risk of Salmonella food poisoning. 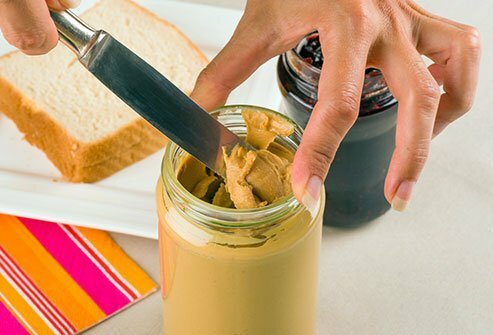 This bacteria can be found in fruits, vegetables, peanut butter, and some processed foods as well. Be especially careful during the summer. 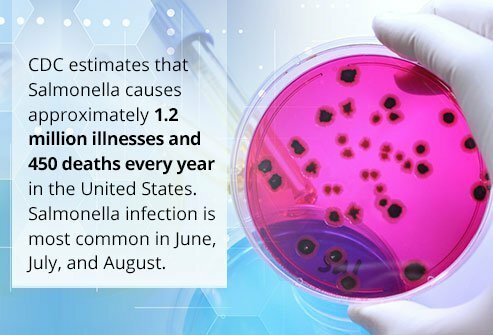 As temperatures rise, they create ideal circumstances for the bacteria to thrive. Picnics and backyard barbecues are especially at risk of an unwanted visit from this sneaky pathogen. Make sure you keep your hot foods hot and your cold foods cold. Refrigerate all leftovers right away. 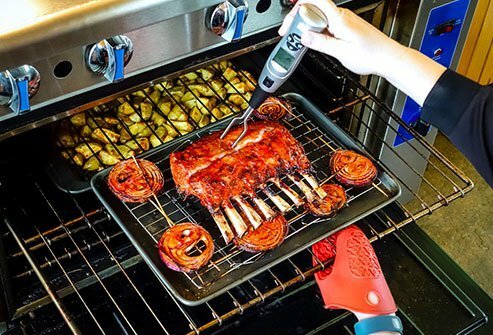 Never let your food sit for more than two hours—or more than one hour if it’s hotter than 90 degrees Fahrenheit outside. 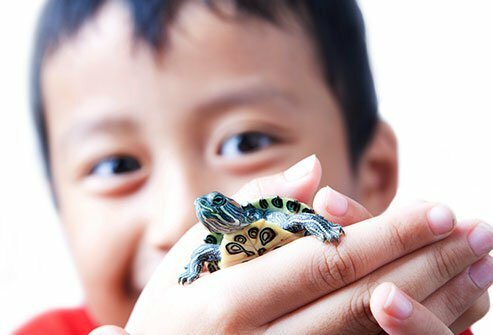 Reptiles and amphibians have been singled out by the CDC for the Salmonella they carry, which poses a particular risk to children under 5. Small turtles were responsible for a 2015 outbreak that sickened more than 200 people. Some of the sick people hadn’t even touched the turtles. 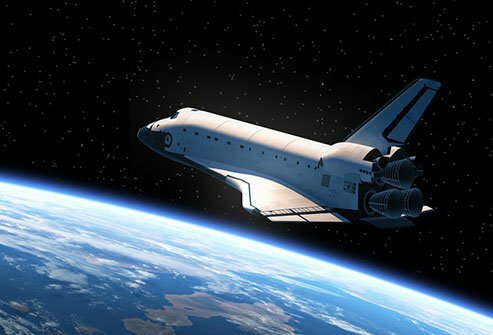 Discovering this strange fact has changed the way scientists think about long-term space travel, such as a manned trip to Mars. It’s impossible to completely disinfect a spacecraft because so many bacteria are found on humans already. That means we will need to come up with a way to fight off these especially dangerous organisms if we want to travel beyond Earth’s orbit. For all the terrible, harmful things this bacteria causes, it’s worth considering one way they may actually be used for our benefit. A scientist in California is studying whether he can turn these nasty bugs into cancer fighters. 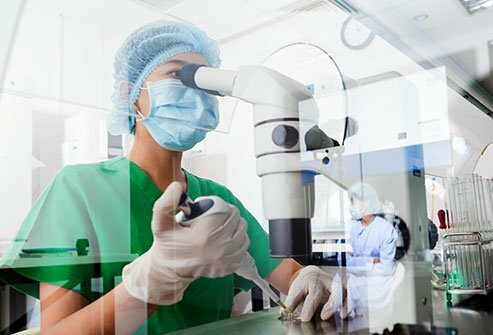 Professor Jeff Hasty of UC San Diego has engineered the bacteria to remove their disease-causing tendencies and replace them with the power to attack cancer tumors.